Plot Outline: Marnie, Dylan, and Sophie Piper have their first out of many adventures! On Halloween, while Marnie is arguing with her mother Gwen, the kids' grandmother Aggie comes to visit. Aggie wants to start Marnie's witch training before her 13th birthday or Marnie will lose her powers forever. But there is another reason for Aggie's visit. 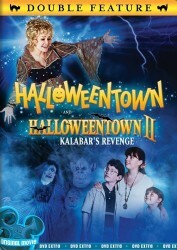 Something dark & evil is growing in Halloweentown & Aggie wants help to defeat it. While Aggie & Gwen are arguing, Aggie uses magic which Marnie observes. After Aggie leaves to return to Halloweentown, Marnie, Dylan and, unknown to Marnie and Dylan, Sophie follow her onto the return bus. Soon afterwards, Gwen follows the children to Halloweentown. While there, Aggie & Gwen are attacked by the dark force in a movie theater. Marnie, Dylan & Sophie race to get the ingredients to activate Merlin's Wand to stop the evil.